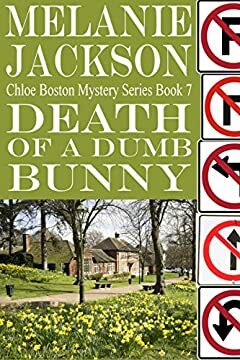 "Death of a Dumb Bunny" is the seventh book in the Chloe Boston Cozy Mystery Series. Someone has murdered the Hope Falls Easter Bunny, a charming and rather simple man who hasn't an enemy in the world. The town is swarming with visitors ready to march in the parade and hunt for hidden eggs. Somewhere in the crowd is a killer. Chloe and her faithful dog, Blue, must put aside their Easter bonnets and hop into action if she is stop the mad archer before he strikes again.